Employees working hard in various office settings. Business Men in the Office MS man with full head of black hair wearing suit & tie while seated at desk, he is smoking a tobacco pipe while picking up telephone receiver, man talks on the telephone, leans back in his chair & looks over his shoulder as if looking at an out-of-frame clock hanging on wall. MS older grey haired man wearing grey suit w/ bow tie seated at desk while talking on phone, he hangs up the telephone receiver & continues with his work, plugging numbers in ledger into number tabulating accounting machine. MS middle-age executive type man seated at desk wearing a three piece suit with tie, he ends his telephone conversation, hangs up the receiver and picks up a tobacco pipe, lights a match and starts puffing. Brief MS man seated working at drafting table, using pencil & ruler to draw straight lines (designer, architect). MS two men seated at desks looking over ledgers, using their fingers to keep place on the paper. 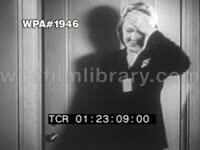 MS Caucasian woman wearing polka dot dress, sitting at desk in office, talking on telephone, another woman typing behind her; tracking shot begins, Caucasian men and women sitting at desks and working (one older man is smoking) shot ends with MS brunette woman wearing blue sweater and neckerchief, typing at desk. TLSs inside another office, two Caucasian women sitting at desks and talking on telephones, another working at desk while yet another writes on chalkboard in BG (2 takes). MS Caucasian woman wearing blue sweater and gray knee-length skirt, threading unidentified machine that seems to be punching holes in information cards. MS same woman changing spool on machine that appears to convert paper tape to punch cards for early data-gathering computers. MS brunette Caucasian woman at desk, looking through papers, making notes with pen; she puts them down and makes a call on a rotary telephone. TLS twelve Caucasian women sitting at desks, doing clerical work-- filling out and filing cards-- in office. Office Work - Typist MCU woman seated at desk adorned by vase of colorful flowers, she hammers away at manual typewriter keys, smiling as she transcribes in her 1950s plaid ensemble. MCU woman in blue sweater w/ neck scarf accessory typing at desk. CU "Sales Order" moving across typewriter as order is processed. MCU woman manually feeding paper into typewriter, she is seen happily typing way at her desk. Over-the-shoulder MCU woman with hair pulled back in ponytail seated in front of typewriter, she picks up telephone receiver to answer call. Office Copy Room MCU activity inside office copy room staring with woman operating mimeograph machine showing rotating ink drum & stacking of paper copies, next we see man grabbing printed papers from organized shelves & stapling them together, shot continues with woman operating punch machine. Similar shot repeated of the mimeograph. Secretarial Office Work CU female hand using pencil to write shorthand dictation on spiral notepad (notebook). MCU notebook on stand next to typewriter for transcribing, pan up to show desk lamp w/ bright florissant bulbs turned on. Office Work CU drawer of filing cabinet being pulled open, female fingers sift through the folder files organized alphabetically. MCU female hand hanging up telephone receiver, the woman immediately pulls out index card filing drawer & transcribes card info onto piece of paper. CU female fingers pulling paper documents out of filing cabinet drawer. CU columns of numbers printed on paper ledger, female hands place handwritten receipt next to the ledger numbers, using pencil to check matching numbers on the account (book keeping, record accounting). MS two female switchboard operators at work, plugging jacks & connecting calls. MS two women seated at desks facing each other, they both sort through large pile of mail, woman at telephone switchboard seen in BG. MS women seated at desks in open office space, woman in FG talks on the phone then jots down notes once putting the receiver down. MS open office space that looks like a bank interior, man in FG is seated at desk talking on phone, woman in BG is seen working at her desk. MS two Caucasian men dressed in matching white long sleeve dress shirts & pale grey/blue ties sharing a desk, one is seen talking on telephone, profile view of young woman as she walks into frame in FG & files papers away in filing cabinet. 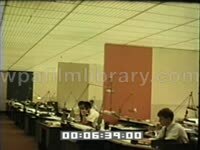 Master 10 - Tape 2 Color footage of secretaries and workers in office, c. 1950, typing, filing, writing, etc. Shot starts at one secretary and tracks nicely down row of desks to rest on a second one, who types away. Second shot of a different office, c. 1959, with secretaries at desks, a little dirty. Ends with very brief shot of secretary with what looks like a mid-50s tickertape machine. Master 109 - Tape 1 General office work, 1950s: Wide MS middle-aged white female secretary wearing dark peach-colored dress & eyeglasses walking to desk, sitting down and then typing; white man wearing pinstripe business suit sits at desk in FG, writing & processing paperwork; three file cabinets separate their desks; stuffy utilitarian office. Nice wide MS two Caucasian men sitting at desk & reviewing paperwork at night, both wearing light colored ties and white dress shirts; skinny young white woman enters frame, walks to filing cabinet, opens drawer, flips through files. Master 23 - Tape 2 Women working in the business world, 1950s: Slight low angle MS of standing in a vault, she is looking over documents pulled from a safe deposit box. TLS women in office seated at desks sorting index cards. MS two women at desks (shot from over their shoulders) operating primitive business machinery, probably keypunch machines, one giggles. MS two women looking over some sort of brochure, one woman uses a red pencil to circle items on the paper. MS two women, in identical white sleeveless blouses (one wears a red rose pin to accessorize), looking over a document, one woman looks like she is explaining something to the other (starts with one woman staring dully into the camera). 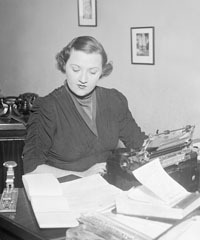 MS young Caucasian woman wearing light gray business suit, seated on steps of house, typing into laptop computer; CUs hands typing on computer; high angle MS woman typing on keyboard of laptop computer. MS young white woman wearing business suit walking down sidewalk while talking into small cellular phone, looking at her watch; she looks stressed out and/or annoyed (several takes). This clip will require additional time and pricing. Master 1777 - Tape 2 Excellent LS/TLSs white men & women dressed in mid-sixties business attire working in large, open office space, young white woman wearing white dress, sleeveless black top & white pumps walking to another woman's desk with file; metal desks, stacks of paperwork, rotary telephones, stuffed in-boxes, etc. Rear view TLSs employees sitting at metal desks, reviewing & pushing papers, working. Corporate America in the not-so-swinging 1960s. A woman with short, curly red hair holding a clapboard in front of an office set. MS Seated at the office desk (which holds a small monitor and a tape calculator) are two white businessmen in business suits. Two men in button-down shirts, skinny ties, and slacks walk into the office and greet the businessmen. The younger of the two stands up and shakes the men's hands. They make small talk and the seated businessman hands a folded brochure to one of the visiting men. He peruses the paper as he speaks to the others. The men continue to talk; one man folds his arms in front of him. CU Clapboard with chalk writing. MCU White male businessmen talking in office. MS Men talking in office with wood paneling. Working Women MS woman standing inside open bank vault, looking at papers kept in safety deposit box. GV young women in office seated at desks, filing index cards in an over-sized Rolodex style filing device. 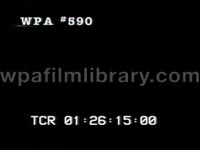 MS profile two young women working in office, using teletype / teleprinter machines. Working Women - Job Training MCU twenty-something woman seated in office watching on as an older woman next to her explains & demonstrates job procedure which entails reading through newspaper print, circling & x-ing sections with pencil (editing, editor). MCU two female office clerks seated next to each other as one holds a punch card, explaining procedure as the new hire looks on. Establishing shot of open office space w/ young women at desks answering telephones, woman in BG writes on chalkboard. Several MSs of young women at desks answering telephone calls. Man at Work MS Caucasian business man w/strawberry blond hair seated at desk w/ stack papers in front of him, he reads & signs the paper on top then moves on the next one. MS open office space w/ women at desks performing various tasks, filing papers & answering telephone calls. Rear MS of two female switchboard operators connecting lines, one is older w/silver-gray hair, the other young w/brunette hair pulled back in ponytail. GV open office environment showing women of varying ages working at desks, answering telephones & filing index cards. MCU female hand opening index card filing cabinets. Office Work - Typist CU female hands typing away on "ROYAL ELECTRIC" typewriter keyboard. Various MS/CUs around the conference room as senior editors and reporters discuss developing newspaper issues and articles, ages and ethnicities are mixed, many coffee cups - soda cans and prepared sheets are seen on the large table, the late 1990s fashion includes sweaters- ties-blazers and over-sized eyeglasses. GV library aisles. GV/MS shelves of article files filed alphabetically. POV walking down aisles lined with file shelves. Tracking shots past aisles of file shelves. GV library aisles. Office Space - Inside the Chicago Tribune Building - Good for general office / computer material. 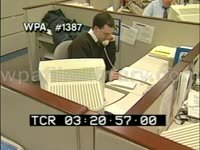 Various MCU/MS/GV/CU men and women (Caucasian and African American) working in busy open office space, people seen working at computer banks and talking on telephones. MS young man seated in cubical, hunched over desk while talking on phone and writing notes, pan to TLS bank of cubicles with men working on computers and talking on telephones, pan back to MS the young man on the phone. Back MS man seated at cubicle desk, MS two men working at cubicles, GV open workspace filled with banks of cubicles and people working at them, rear MS single cubicle with man working. MCU man dialing and talking on phone, he is hunched over at his desk writing notes. MS pans from stacks of newspapers to man in cubicle talking on phone. MSs man in cubicle talking on phone, camera zooms in. MCU man on the phone, hunched over his desk as he takes notes. TLS bank of cubicles with men working on computers, man in FG talks on phone. Over-the-shoulder MCU man in cubicle hunched over desk while talking on phone and jotting down notes. CU man's face as he looks at computer monitor. MS man in cubicle typing on computer keyboard, zoom in to CU of face, pan out to MS of man at computer. Over-the-shoulder MCU man typing on computer keyboard. Over-the-shoulder MCU computer monitor as man types, zoom to CU computer screen (text is an obituary), pan out to MCU computer monitor as man types. MS man working at computer. Rear MS man working at computer, pan out to TLS of open office space with many people working at desks. Working at Computer - Inside Chicago Tribune Building MCU man seated at computer wearing dress shirt with tie but looking casual with his long hair pulled back into a ponytail and wearing three earrings in his left lobe, zoom to CU man's hand using mouse, pan out to MCU man working at computer. Rear MS man working at computer, other office activity seen going on in BG. GV open office space filled with men working, pan to rear MS ponytail man working at computer. Woman working at an office machine. She pulls a piece of paper out of it. She reaches up and knocks a book off the window sill. Camera looking down from the window onto the street. Architect Office. Lines of drafting tables. Architects and engineers work at drafting tables.